How can I create maps on Google Maps? Google Maps allows users to make their own maps, such as this collection from House Divided. This FAQ will review the basic steps to create a map on Google Maps. You can always learn more about how to use Google Maps through their user guide. Or we have created a short video tutorial that you might find even more effective for learning how to create custom-made history-oriented maps on your own. 1. 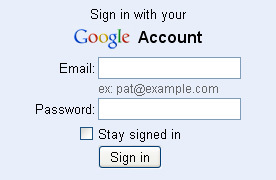 LogIn – If you have a Google account, go to Google Maps and login. If not, you will need to create one in order to make a map. 2. 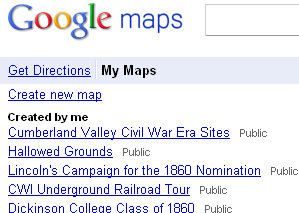 Create Map -Look for the “My Maps” link on left side of the page, which is located directly below the Google Maps logo. After clicking on that link, you can create a new map. All of the maps you create will appear here in the left column. 3. Privacy Options – If you don’t want your map to be public, select the “unlisted” option for your map. 4. 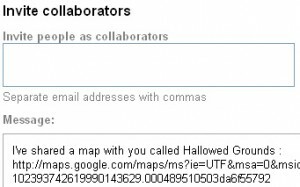 Collaborate After you create a map, click on the “Collaborate” to invite other people with Google Accounts to help work on the map. You can learn more about this feature on Google’s user guide.